State of Decay 2 launches on May 22nd for Xbox One and Windows 10 PC as an Xbox Play Anywhere title. It’ll be priced at $29.99 for the Standard Edition and $49.99 for the Ultimate Edition, and will launch into Xbox Game Pass on its release date, Microsoft has confirmed to IGN. The zombie-survival RPG from Undead Labs is also the IGN First game of March 2018. The Ultimate Edition of State of Decay 2 includes early access to the game on May 22nd and a free Xbox One copy of the State of Decay: Year One Survival Edition as well as the Independence Pack and Daybreak Pack DLCs, both of which will be released in the future. State of Decay 2 is the long-awaited sequel to the Xbox Live Arcade hit that debuted in June 2013 on Xbox 360. The sequel was revealed at E3 2016, and it runs on Unreal Engine 4. It’ll also feature four-player co-op multiplayer, and IGN will have additional coverage on their website over the next month. State of Decay 2 will also be playable at the PAX East showfloor later this month in Boston, USA. I had the chance to check out an extended behind-closed-doors demo of State of Decay 2 at E3 2017, and I learned about how the title aims to deliver a truly simulated experience where cooperative gameplay with your friends is key to survival. Undead Labs also showed off its vehicles which can be stolen, including lowrider American muscle cars that can be used to run over zombies. You can even use the doors to smash into zombies! There’s even a vehicle autoshop with upgrades for these cars, as well as parking slots where you can store, repair, and refuel them. These are featured in your base, which can be upgraded and customized as you make it a safe-haven for survivors and keep away any zombie stragglers. You’ll also need to have an active supply of food and water for these survivors and working together is key because you’re a community of people. There is no singular hero character in State of Decay 2, and it’s that style of progression, survival, and online integration which makes this game look so unique and fun. 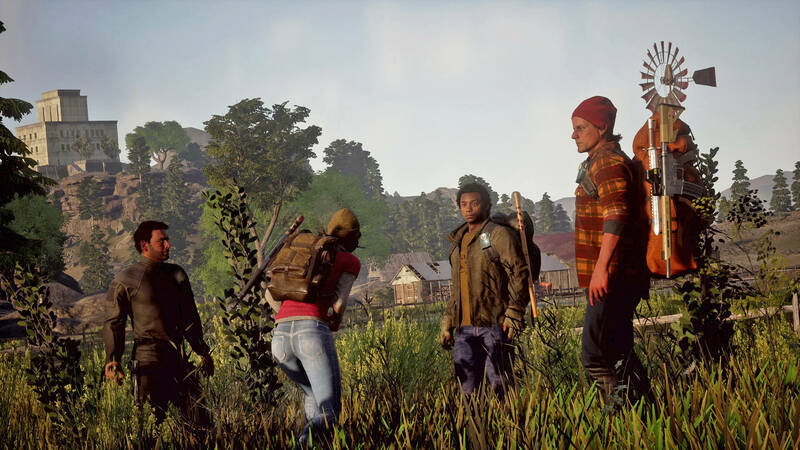 Overall, State of Decay 2 is a fun third-person, action-adventure style game, and one I’m extremely excited to check out on May 22nd when it finally launches on Xbox One and PC. It was also featured in our Most Anticipated Games of 2018 story from January.